Norwegian University of Science and Technology (NTNU – Norway) in collaboration with Bahir Dar University – BDU (Ethiopia) invites academic staff from BDU to apply for a PhD scholarship within the framework of the NORHED funded project on "Advancing Quality in Education in the Primary and Lower Secondary Schools in Ethiopia and South Sudan". The project is a five years project from August 2016 to August 2021, led by BDU with grant funding from the Norwegian Agency for Development Cooperation (NORAD) NORHED Programme. The project aims to build institutional capacity of BDU and UJ to improve the quality of Science and Mathematics education in primary and lower secondary schools and it has three components: Education, Research, and Institutional Capacity Building. As part of the research component, there is a plan to recruit three PhD candidates on competetion basis from BDU staff who will work on the following focus areas. Higher order thinking in science curricula and instruction – the Ethiopian education policy has the aim of strengthening problem solving capacity of citizens. Classroom instruction and curricula need to be designed in a way that this aim could be best achieved. 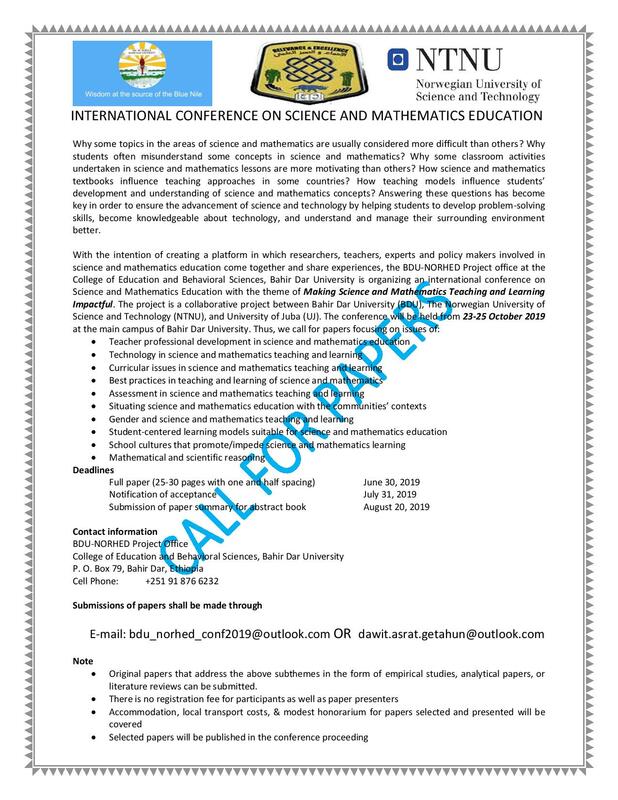 Examination of the existing situation and practice in the context of primary and lower secondary science teaching and learning with a possible pilot intervention of an instructional model for enhancing higher order thinking skills of students in science disciplines is encouraged in the project. Assessment practices in science – the practice of continuous/formative assessment is widened in the Ethiopian education system starting from primary grades. Reports indicate that the practice is not implemented at its best. The problem may emanate from teachers’ lack of proper understanding about continuous assessment. In particular, the fact that teaching science disciplines involves students’ participation in hands on activities, demands science teachers to be proficient in assessing the variety of activities students are engaged in. The PhD project needs to focus on enhancing the formative assessment practices of teachers in the context of teaching and learning science disciplines. Norwegian University of Science and Technology (NTNU – Norway) in collaboration with Bahir Dar University – BDU (Ethiopia) invites academic staff from BDU and University of Juba (UJ) to apply for a PhD scholarship within the framework of the NORHED funded project on "Advancing Quality in Education in the Primary and Lower Secondary Schools in Ethiopia and South Sudan". The project will be implemented over a period of 5 years (August 15, 2016 - August 2021), led by BDU with grant funding from the Norwegian Agency for Development Cooperation (NORAD) NORHED Programme. Ethiopia’s national strategic policy for Science, Technology and Mathematics Education emphasizes the improvement of teaching and learning science and mathematics from pre-school through tertiary levels of education. The policy is aligned to the objectives stated in the second Growth and Transformation Plan (GTP II), the fifth Education Sector Development Program (ESDP-V) and Climate Resilient Green Economy (CRGE) and supports for the achievement of these objectives. The policy also guides the education sector on how to develop the human resources required to achieve the national objectives of leading the country's rapid and demanding economic growth. Hence, this project is expected to contribute to the national development goals by developing the capacity and competence of the human resource in STEM education, one among which is Environmental Education. Sustainability is a global issue which should be a major concern for every country. Likewise, developing countries like Ethiopia need to give priority for sustainability. Environmental sustainability concerned about issues related to climate change, land degradation, resource scarcity and other national and regional issues would be pertinent in current efforts to promote science and technology or STEM driven economies in the global south. To integrate concern for sustainability into the development of the society, it is important to start with primary and secondary education and give children relevant understanding of environmental problems and how society can deal with them. A PhD research proposal pertaining to the mainstreaming of environmental issues into the school curriculum or how they are represented in the education sector are welcomed. Specifically, the study may focus on how to give students a reflexive and informed view on key environmental issues such as the degree to which new research on environmental issues trickle down into school curricula, in what way do the schools have a critical perspective on the relation between environmental problems and the social costs and benefits to environmental policies. Further the study has to look at how those issues can be touched in a manner actually motivating students to learn more and engage in social action towards greater sustainability as well as how environmental knowledge can be transferred through environmental and geographical education to give environmental engagement and concern. Expected start date: The planned starting date is January 2018. The student will be expected to refine the research proposal at NTNU, review literature, participate in seminars and possibly take some methodological courses. Application deadline: All application materials (including scanned copies of academic documents) must be received by 17, November 2017 until 11 o’clock Ethiopian time.